Habit: Caudex woody. Stem: generally 1 per caudex branch, from center of rosette elevated on woody base; generally 3--7.5 dm, proximally with short-stalked, generally 4--7-rayed hairs 0.1--0.3 mm. Leaf: basal 1--3 mm wide, entire; hairs short-stalked, 4--9-rayed, 0.1--0.3 mm; cauline 10--30, distal hairy, basal lobes 0 (to < 0.5 mm). Inflorescence: 8--25-flowered, occasionally generally +- 1-sided in fruit; fruit pedicel reflexed, abruptly recurved at base, 8--16 mm, hairs appressed, branched. 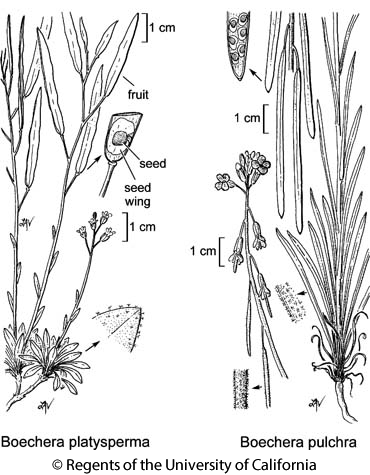 Flower: sepals hairy; petals 9--16 mm, 2--5 mm wide, purple (white); pollen ellipsoid. Fruit: strongly reflexed, generally appressed, 3.3--8 cm, 2.5--4 mm wide, hairy throughout; style 0.1--0.3 mm; ovules 68--106. Seed: in 2 rows, 1.7--2.8 mm; wing 0.25--0.65 mm wide. Citation for this treatment: Michael D. Windham & Ihsan A. Al-Shehbaz 2012, Boechera pulchra, in Jepson Flora Project (eds.) Jepson eFlora, http://ucjeps.berkeley.edu/eflora/eflora_display.php?tid=15800, accessed on April 19, 2019.
e&s SN, s GV, s SCoR, TR, PR, SNE, DMoj; Markers link to CCH specimen records. Yellow markers indicate records that may provide evidence for eFlora range revision or may have georeferencing or identification issues. Purple markers indicate specimens collected from a garden, greenhouse, or other non-wild location.